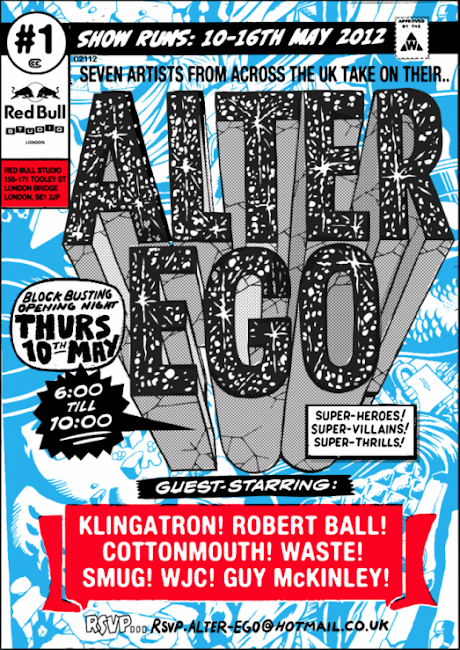 Hosted at Red Bull Studios in London, Alter Ego is a group exhibition of artwork from seven UK based artists. With work from Cottonmouth, Guy McKinley, Klingatron, Robert Ball, Smug, Waste and WJC exploring the idea of having a second identity, as modern society becomes more virtual, individuals are able to project an image of themselves that allows separation from reality bringing with it a perceived identity of fearless power and confidence. Alter Ego is a group exhibition bringing together a variety of styles from graffiti to illustration with each artist studying the theme of a second personality through a mutual influence of popular culture comic books. With an opening on 10th May, Alter Ego exhibits until Wednesday 16th May. Red Bull Studios, 155-171 Tooley Street, London Bridge, London SE1 2JP. More info over at the Alter Ego Facebook events page and Twitter page.